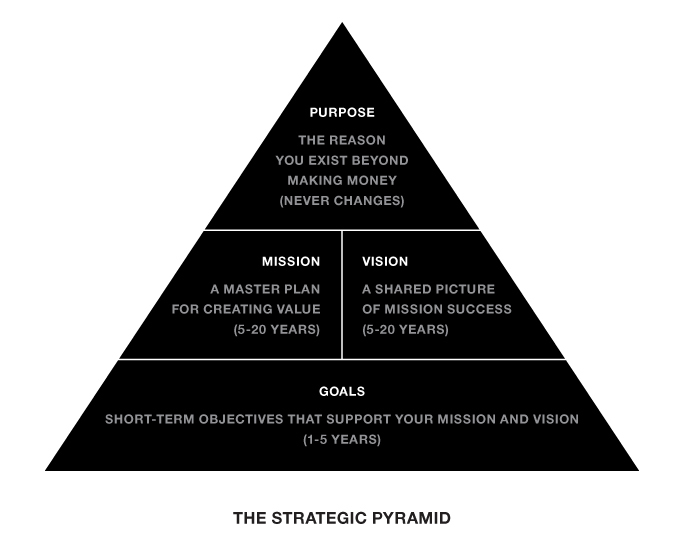 I’ve been studying and researching on the topic of brand and brand marketing, and while looking up more info on the author of the book I recently picked up, I came across this interesting blog article that showed a simple depiction of how ‘purpose’, ‘mission’, ‘vision’, and ‘goals’ align to form a pyramid. In the comments section, you will find people asking where the strategy sits and the author’s response is that the pyramid shows the ‘what’ and the strategy is the ‘how’. I think this is a good thought starter. How do you define ‘Strategy’? What’s your one sentence definition of ‘Strategy’? What do we mean when we say a business organization is ‘weak on strategy’? How can one become stronger in strategic thinking?